Our Canadian friends can now get their Palm Pre for the same price as us Yanks, albeit for a short time. 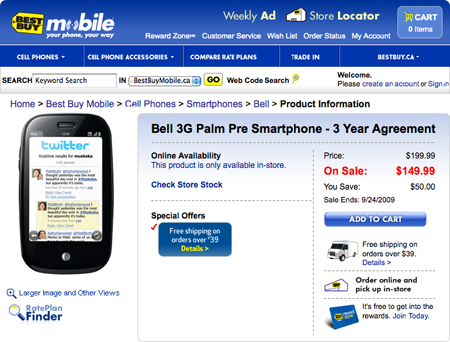 Best Buy Mobile has discounted the Pre by 25%, dropping the price down to $150. How short of a time? You have until September 24th (i.e. Tomorrow) to take advantage of the sale. So if you Canucks been waiting for a chance to buy a Pre for a good price, now is your chance.